Vista Print – My Great Buy! 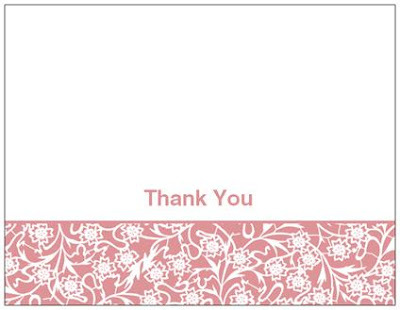 I got 20 PERSONALIZED envelopes and 20 PERSONALIZED thank you notes for $8.99 (including shipping!) If I were to buy thank you notes at a store, they would be around the same price – just not personalized. The back has a gray boarder. The envelope is similar to the above envelope just with a matching pattern. I shopped the “Free” category of the website Here. I shopped in the birth announcements and the thank you notes/stationary area. Since you can personalize your items on Vista Print, even if you shop in an area not intended for what you are doing (in my case shopping in annoucements instead of thank you notes) you can make it just right for you needs. I could have personalized these designs even more to include my daugther’s name but I wanted the option to use it for either child. Start shopping Here. Decorating the kitchen does not have to be expensive. Get this Free 39 Low-Cost Kitchen Crafts eBook. Go Here. Go Here to download a cute and FREE file for digital scrapbooking. 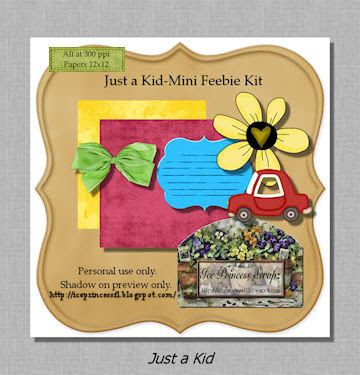 Download the “Just a Kid” Mini Kit. You can use them to create your own digital scrapbook page- for example in the collage area of Picasa. Thanks, Mama Cheaps. Jo-Ann’s Coupon – 40% Off! Jo-Ann’s craft stores usually have coupons in their mailers for 40% off, I have yet to see one online, though, where the possiblities and stock is endless. Use the coupon code JULYA940 for 40% off one regular priced item. Here or click the icon below. Living Rich with Coupons has information on how you can get FREE Smart Water, FREE Hot Shot Ant Spray as well as cheap Breyers Ice Cream this week at Pathmark Stores. Go Here. Christina Higman Photography had a CUTE portrait session in Tallahassee a few weeks ago Here. Does that little angel resemble anyone? Moms by Heart will let you know how to get a FREE fish taco a Long John’s Silver’s Here. Swaggrabber will tell you how to write companies and get FREE things Here. Looking for a fun craft night? Mama Cheaps shares with you how to make your own No Sew Tutu Here. NWA Deals has some FREE Magazine Subscriptions Here. Stephanie at the Coupon Savings Game has some fun 4th of July project ideas for the kids.